I was going to title this blog post “A TARDIS Desk”, but I didn’t want to disappoint people seeking a desk looking like a blue box, what with the 8th season starting and all. 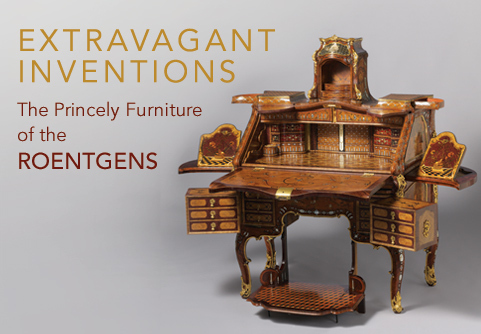 But this desk, and the other pieces of furniture that were displayed at the exhibit “Extravagant Inventions: The Princely Furniture of the Roentgens” that showed at the Metropolitan Museum of Art in New York at the end of 2012, are bigger on the inside. And how they perform that trick is jaw-droppingly amazing. Clever mechanisms open previously secret compartments. Turn a key and spring-loaded drawers open, and then somehow drawers within drawers pop out. Press a brass decoration and a writing surface appears, complete with pen stand and inkwell. Watch the videos on the link and be amazed at the beautiful pieces of furniture–desks, gaming tables, dressing tables, and more–and their unbelievably intricate performances. The furniture was built by two German cabinetmakers, Abraham Roentgen (1711-1793) and his son, David Roentgen (1743-1807). Their works eventually brought them enough fame that David was appointed cabinetmaker to Queen Marie-Antoinette of France, Empress Catherine the Great of Russia, and King Frederick William II of Prussia. David especially became known for his innovative veneer marquetry and the pieces shown are, literally, fit for a king. Another interest item in the show was an automaton of Marie-Antoinette that plays hammered dulcimer using a much more complex version of a music box mechanism to control the arms playing the music, as well as its eye and head motion. It was made by the Roentgens for King Louis XVI as a gift to his queen . Although these treasures do predate by five decades what is usually considered the “Steampunk Era”, they fall so squarely into the Steampunk Aesthetic of beautiful gadgets. And it can’t be too hard to imagine Phileas Fogg sitting down at such a gaming table in the Reform Club and writing out the terms of his wager.